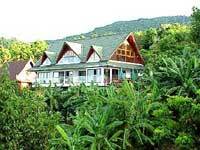 The guesthouse is located on a hill, above Bang Por beach, in a development with security-guards. All of the spacious rooms have sea view. The house provides a cosy common space, a pool with a big, adjoining deck, and a small, partially covered outside-restaurant.